Happy New Month! Please find listed below, a run-down of exciting things happening this weekend. The Monologues are back again! The V-Monologues vs. The Tarzan Monologues – starring Kate Henshaw-Nuttall, Bimbo Manuel, Carol King, Soul Snatcha of the Rooftop MCs, Iretiola Doyle,Kemi Lala Akindoju, Katherine Edoho, Michelle Dede, Kenneth Uphopho and others. Showing for the first three sundays in September. Charity group ‘This Is How We Do’ goes to the streets. An excellent initiative for feeding the masses. Just bring cartons of indomie and boiled eggs! Discussion of Ben Okri’s ‘Starbook’. For the first time in Lagos, a soul stirring tale, “To Love A Ghost”; will be presented on stage by DreamPlayHouse Theatre. “To Love A Ghost” is a play written by Ita Hozaife and directed by Kenneth Uphopho. Venue: The INCUBATOR, COD Church Road, Dideolu Estate, Off Ligali Ayorinde Street, Victoria Island, Lagos. Starring Kate Henshaw-Nuttall, Bimbo Manuel, Carol King, Soul Snatcha of the Rooftop MCs, Iretiola Doyle,Kemi Lala Akindoju, Katherine Edoho, Michelle Dede, Kenneth Uphopho, Ayo Orobiyi, Sola Roberts Iwaotan, Tunde Aladese, Precious Anyanwu, Paul Alumona showing for the first three sundays in September. Poetry, spoken word and music live every Tuesday. 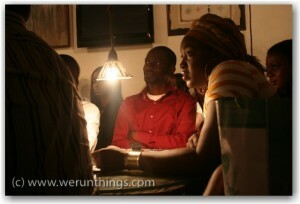 Business Networking and live music from the best of Naija artistes. The maiden of edition kicks off in O.A.U. Ile-Ife featuring Lara George, Ebe, Cobhams, Segun Obe, Rooftop MC’s, Timi Dakolo, Kore, Jahdiel, Sammie Okposo, Mike Aremu, Nikki Laoye, Mixmaster Jay, B.O.U.Q.U.I and DJ Gosperella on the ones and twos. Mounting a banner in Zion….it’s the redefinition babay! Thank you very much for writing this great information! I am looking forward to checking out more blogs! Excellent write up, bookmarked the blog in interest to read more information! The informative summary encouraged me very much! Saved the blog, extremely excellent topics everywhere that I read here! I appreciate the info, thank you. No dress code for Industry Nite; no gate fee. Hello all, the date has been changed for Redefinition Campus. Okay will edit, thank you. Editor pls help! Also Tuesday 7th September is not highlighted. V-Monologues BACK again yep! Not sure about Industry Nite fee/dresscode. Will enquire thanks. is there no gatefee n dresscode 4 d industry nyte?